A major producer of welded steel tubing for the automotive industry was looking to improve coating consistency of liquid corrosion preventatives. They turned to AMCOL for help. The system they were using would plug up and stop coating with no warning; the result was uncoated tubes and premature corrosion. The tube mill operator would turn up the fluid volume to try and compensate, but this caused overuse of oil and contamination of the mill coolant. AMCOL recommended installing the patented AMCOL Model 3200 In-line Coating System on the mill between the turks head and the cut off. 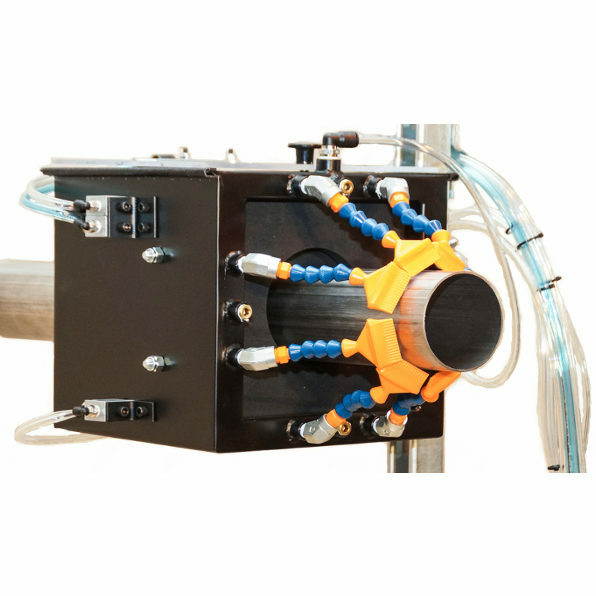 This system, designed specifically for applying liquid storage coatings on tubes and profiles during the production process, integrates an air blow off to remove incoming coolant and then applies a uniform coating of liquid rust preventative to the outer tube surface. Coating weight is adjustable by turning spray points off and on and by adjusting output per nozzle so that individual customer requirements can be met.